Not much detail here but there has been a few failed proposals on the site next door. garden and bar area, ground floor café and ancillary car parking. That's actually quite nice. I like it. Love the colour and design variation. 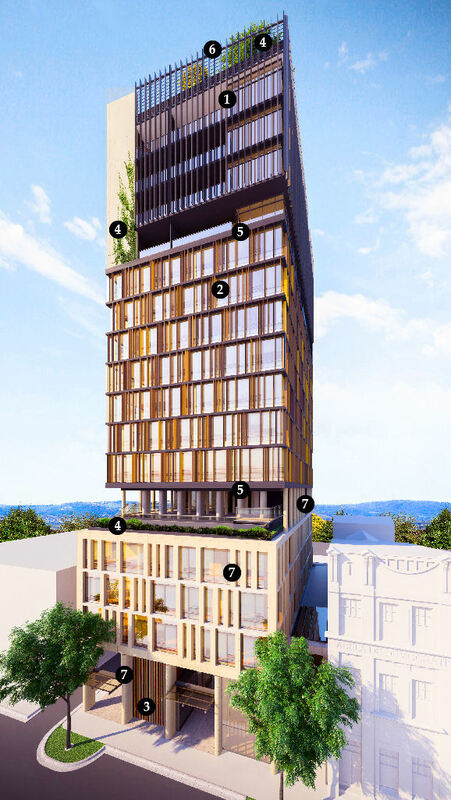 Looks much like the Flinders Street proposal. If we could have more skyline filler in this vein, I would be very happy. Sleek, tall and really helping to fill out this part of the city. Praying there is no blank western wall. I like this very much. Great location in an area just begging to be redeveloped. Bit of a thread bump, but this was approved 7/9/17. Five months since approval... how long until construction starts? Hasn't gone to sales/marketing yet. Site hasn't been listed since approval from what I see, so doesn't look like a flip at this stage. Wait and see. Really like this one. That's what I thought. It looks like the Flinders one, which is a good thing. Well this is a pleasant surprise. Description: Demolish existing buildings and construct a mixed use hotel, apartments, ground level parking and commercial tenancies - STAGE 2 - STRUCTURAL WORKS.